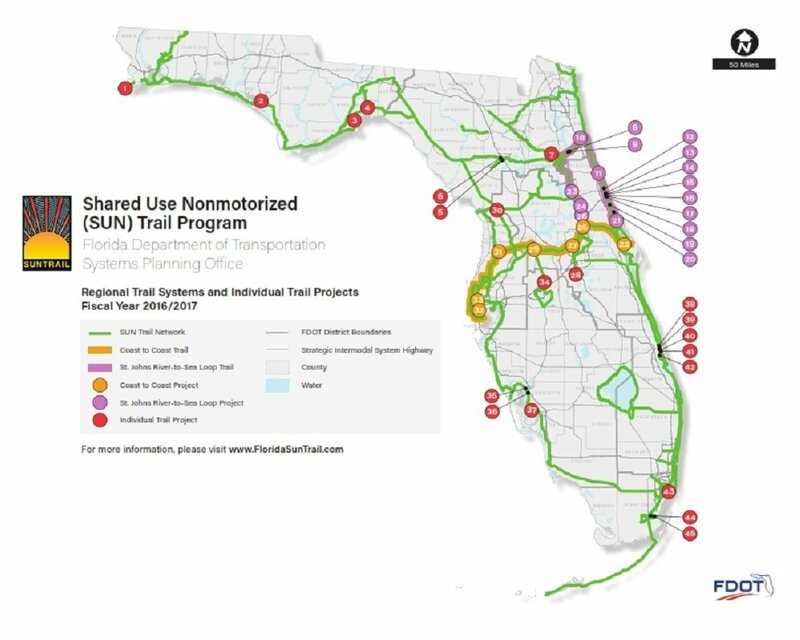 The Florida Department of Transportation (FDOT) announced the selection of the first year of projects to receive funding under the Shared Use Nonmotorized (SUN) Trail program. A total of $44,434,543 million was awarded to 45 separate projects located across 21 counties throughout Florida (see map and project list). The projects include the construction of 11 separate trail segments, which will add or improve approximately 20 miles of trail to Florida’s trail system. Another 34 projects will be in various preconstruction phases of work such as feasibility study, environmental review and design. The funds are for the current fiscal year (2016-17) and are immediately available to begin work. All of the selected projects are in the identified SUN Trail network, which consists of the developing statewide system of paved multi-use trails for bicyclists and pedestrians, physically separated from vehicular traffic. Twenty-two of the funded projects help to advance two major regional trails systems selected as priorities by the Florida Greenways and Trails Council. Five of these are part of the Coast to Coast Connector, a 250-mile trail system linking the Gulf and Atlantic coasts through Central Florida, and 17 are part of the St. Johns River Sea Loop, a 270-mile trail system that will link together several communities including St. Augustine, Daytona Beach, Titusville, DeLand and Palatka. 23 projects are for individual trail segments throughout the rest of the state. The SUN Trail Program was established during the 2015 legislative session. More information about the program can be found at http://floridasuntrail.com.